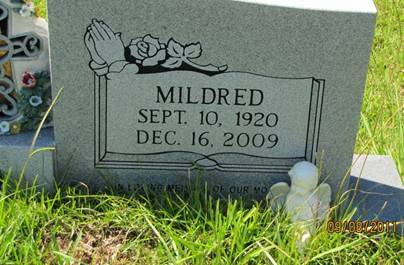 Mildred Alford, 89, of Tylertown died Dec. 16, 2009, at Southwest Mississippi Regional Medical Center. Visitation is 5 to 9 tonight at Hartman-Hughes Funeral Home in Tylertown. Services are 11 a.m. Friday at the funeral home chapel, with the Rev. Mike Anderson officiating. Burial will be in Elliott Cemetery. Mrs. Alford was born Sept. 10, 1920, in Walthall County, to John Albert and Emily Elizabeth Stogner Lowery. She was preceded in death by her parents and her husband, Farral Alford. Survivors include three sons and two daughters-in-law, Farral and Sue Alford of Talladega, Ala., Jack and Mary Alford of Springfield, La., and Billy Alford of Tylertown; two daughters and one son-in-law, Nell and Alton Ryan of Brookhaven and Christel Van Dan of Tylertown; 10 grandchildren, 22 great-grandchildren and three great-great-grandchildren. Pallbearers will be Greg Ryan, Jack Alford Jr., Duane Alford, Raymond Van Dan, Billy Alford Jr. and Benji Alford. Honorary pallbearers are Vernon Alford, Grady Alexander, Earl Alford, Jimmy Lowery and Ben Whitten. 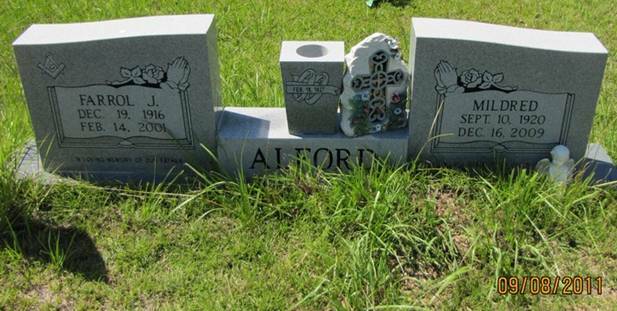 AAFA NOTES: SSDI records confirm the birth and death dates of Mildred Alford (SS# issued in MS), last residence Tylertown, Walthall Co., MS.
We included the obituary of her husband, Farrol Jasper “Preacher” Alford, in Mississippi Obituaries. Mildred joined AAFA after her husband’s death. AAFA records list him as Farrol Jasper Alford; his obituary and his gravestone spell his name Farrol. For more information about Farrol’s family, see AAFA’s published genealogies, Descendants of Jacob Alford, b. 1761 NC and Known Descendants of William Alford 1804 GA – after 1860 MS. Her husband’s lineage: Farrol Jasper 1916 MS1, Samuel Nathaniel 1885 MS2, Needham Jasper 1862 MS3, Henderson 1829 MS4, William 1804 GA5, Jacob 1761 NC6, Julius 1717 VA7, James 1687 VA8, John 1645 VA9.